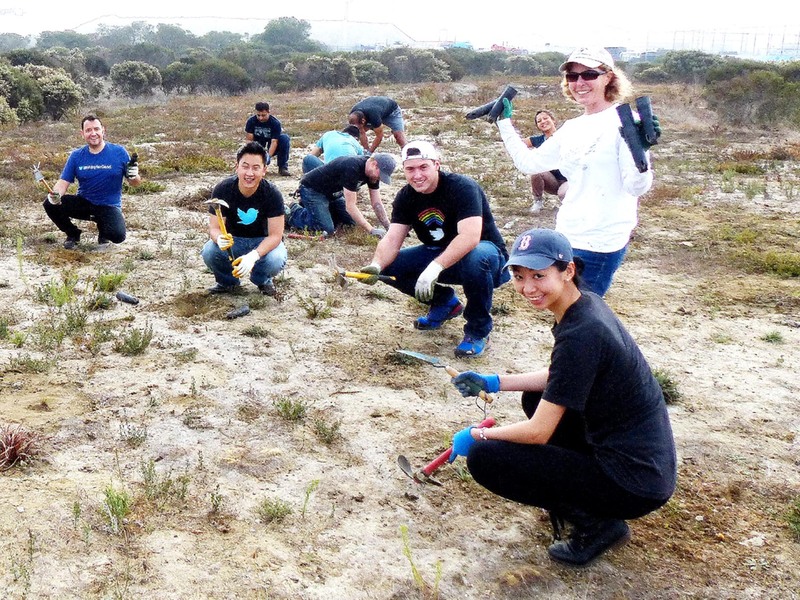 Nature—with the help of hardworking Golden Gate Audubon volunteers—is reclaiming a hidden wetland consisting of nearly five acres of isolated industrial land near Pier 94 on San Francisco’s southern waterfront. Located in the shadow of container ships and heavy equipment, the restored salt marsh and adjacent upland will provide valuable habitat for birds, butterflies, and small mammals. It will also provide residents of the neighboring Bayview-Hunters Point community access to a unique urban wildlife experience. Golden Gate Audubon’s cleanup efforts began on Earth Day 2002. Since then, hundreds of volunteers have hauled away over a half-ton of scrap metal, several truckloads of star thistle, and hundreds of old tires. With the help of our members and volunteers, we are gradually changing the landscape and creating valuable habitat for birds, fish, tidal marsh plants, and other wildlife. 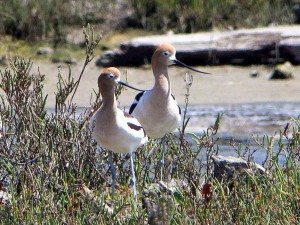 Native salt marsh has already formed along this small part of the San Francisco Bay shoreline and is beginning to attract sandpipers, herons, terns, Snowy Egrets, Willets, Killdeer, and American Avocets. The tidal wetlands at Pier 94 are among the few remaining such wetlands around the bay. They have the potential to provide much-needed habitat to shorebirds—making their restoration an important priority for Golden Gate Audubon. Invasion of exotics like eastern cordgrass Spartina alterniflora (an invasive species that is destroying wetlands throughout the bay), threatened native plants and wildlife at the site and is now being controlled. Golden Gate Audubon monitored the plants at Pier 94 with the Port of San Francisco. See the Port’s report on our monitoring efforts 2008 Pier 94 Plant Monitoring Report. The State of California’s Urban Greening (Prop 84) grant and a grant from the City of San Francisco’s Carbon Fund and others provided funding for upland sediment and vegetation 2010-2015. Dr. Peter Baye prepared a Terrestrial and Wetland Vegetation Management Plan which we seek to implement. Funding is needed to implement this plan. 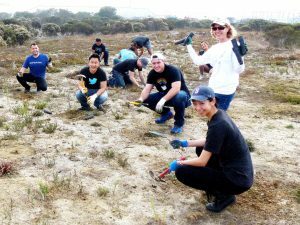 Join our volunteer work parties in removing invasive plants, trash and planting hundreds of native plants. 1st Saturday each month 9:00 am-12 noon.